St Hilda’s has a long established and rich history of volunteering, with volunteers involved in services across the organisation. This continues today with the Community Volunteer Project. We host a wide range of volunteers, from individuals, to students from Cheltenham Ladies College (its alumni association, Guild, is our founding institution), to corporate volunteers volunteering on either a short- or long-term basis. We need volunteers who can help us provide a range of services designed to promote social inclusion and help members of our local community in their daily lives. We aim to recruit volunteers from all backgrounds and cultures to reflect the nature of our local community. Free training – available on personal development and Social Enterprise Skills. Travel and Lunch expenses – Volunteers get food and travel expenses paid while working here. References – If you volunteer for three months we can provide you with a reference. If you are interested in volunteering, you can pick up the volunteer application pack from reception at St Hilda’s East Community Centre or download it online. Please return your completed application form to us either by post, hand-delivered or by email. Volunteers assist with lunch club activities such as arts and crafts, keep fit, games and quizzes, parties, outings and teaching computer classes. Administration opportunities are also available which could include helping to produce with our newsletter. This project involves selling affordable fresh fruit and vegetables to the local community, with an emphasis on locally sourced produce. 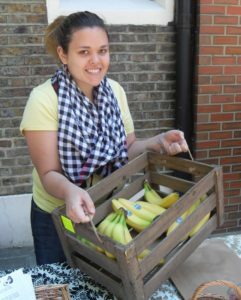 We need volunteers interested in helping to source and sell the produce to make this social enterprise sustainable. As a volunteer, you would assist in regular activities with a vibrant group of local women. Sessions include cooking, arts, sewing and swimming and various outings throughout the year. You can also help organise events such as fundraisers, international women’s day and training sessions. Volunteers are needed to work on social education programmes with this group of young people. You can develop skills in conflict resolution, peer support and youth work. This project runs on a Saturday daytime and involves supporting young people with disabilities to socialise and take part in activities such as arts and crafts, going to the theatre, music workshops, etc. This project could help you to gain social work and disability awareness skills with a group of creative young people. As a volunteer, you would work with pre-school children aged 0-4 years assisting in crèche childcare and play sessions. You can gain childcare skills and develop an understanding of child development. We currently only accept volunteers who have, or are studying towards, a childcare qualification. Volunteers are needed in the reception area at St Hilda’s East Community Centre and Sonali Gardens. You would provide a welcoming atmosphere for visitors, book appointments and undertake various administrative duties. At our day centre for local adults and elders with disabilities you would be involved in escorting members of the group to and from Sonali Gardens and assisting with activities such as exercise, music sessions, playing carrom and reading. You will gain skills necessary for work within the health and social care fields. Many of our projects need passenger assistants and (MiDAS) trained drivers. If you have a clean driving licence for the past 2 years and are over 21 you could be eligible to train as a minibus driver. We will cover the cost of training and ask for at least 3 months volunteering from you in return. Volunteers who are currently studying with Island Advice Centre are placed at our Advice Service to provide advice on issues such as housing, benefits and debt. St Hilda’s works with a wide range of large and small companies who understand the benefit of voluntary action for employers, employees and the community as a whole. Volunteering improves morale, increases staff retention and helps employees to develop new skills, confidence and enthusiasm in a creative environment which can be transferred to the workplace. In the last year St Hilda’s has placed over 100 employees as volunteers and we would welcome support from other companies. If your corporate social responsibility team would like to support St Hilda’s, please contact us on 020 7739 8066 or by email. We recruit corporate teams for a day at a time who may want to help with an event, paint some rooms or organise an outing. These teams have included volunteers from Barclays Bank, Coopers, Deloitte and Natwest. St Hilda’s East has a long term and close working relationship with the following companies who give a regular commitment of time and energy to our community through volunteering. Staff from a number of major national law firms run pro bono legal advice sessions at St Hilda’s East Community Centre and Sonali Gardens Centre. DLA Piper UK, Berwin Leighton Paisner, Lloyd’s Register and Allen & Overy help with volunteer IT tutoring at St Hilda’s Community Centre and Sonali Gardens. Staff from Credit Suisse have given their time to assist with the design and production of our Annual Report since 2006. City of London and Lumina regularly provide one-off volunteers as photographers, massage therapists, reflexologists, social media consultants, HR consultants, event organisers and mentors. Canary Wharf Group have facilitated networking at St Hilda’s and Corporate Social Responsibility events to increase partnership work between local and corporate companies. 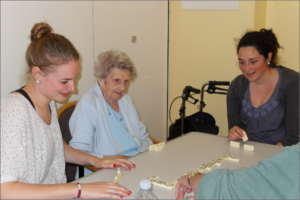 Cheltenham Ladies’ College (CLC) students have been volunteering at St Hilda’s for many years now in various capacities. Typically, CLC students volunteer during school holidays from a few days to several weeks. CLC students have been involved in a wide range of projects including assisting with days trips’, helping in the crechee, organising activities such as quizzes and arts sessions. 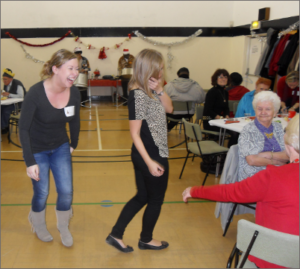 The Youth Project and Older People’s Project are among our services that have benefits from the girls’ involvement. A placement at St Hilda’s will be an added interesting dimension to your university application, Duke of Edinburgh Award or generally to provide you with a new experience where you can meet a set of diverse and interesting people from a totally different background to yourself. If you are at CLC and would like to volunteer at St Hilda’s please contact us by email or telephone 020 7739 8066. St Hilda’s has worked in partnership with Winant Clayton Volunteering for over 20 years. A volunteer has been placed every summer with us for 10 weeks and this has proved to be a fruitful and enriching experience for both the volunteer and St Hilda’s projects. Volunteers are supported with accommodation through WCV and volunteer at St Hilda’s on a full-time basis during their placement supporting the Older People’s Project. St Hilda’s has worked in partnership with CAPA International Education for over 5 years. St Hilda’s provides experiential learning for students combining their academic and practical experiences together via community placements. Internship students are placed from 2 -8 weeks and provide a unique and special quality to St Hilda’s community.